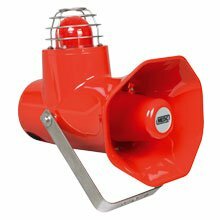 Since 1975, the oil and gas industry has relied on the MEDC brand for the most reliable and highly respected alarms and loudspeakers in the industry. 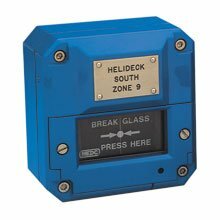 Designed for potentially explosive atmospheres and harsh industrial and marine environments, the range includes: alarm call points, status lights, strobes and steady lights, horns, speakers and control and distribution panels. Extensive quality certifications include ATEX, CQST, UL, ULC, CSA, GOST R, GOST K, IECEx, CCC and Inmetro and demonstrate our commitment to maintaining our leadership position in the market. The DB3B is a high power explosion proof sounder, introduced as a replacement for the current DB3 with improved functionality and performance. Certified for use in a wide range of temperatures from -55ºC to +70ºC, the Ex enclosure is manufactured from GRP with a rugged thermoplastic flare providing a corrosion free and aesthetically pleasing product. Capable of producing 122dB @ 1m and with a range of pre-recorded tones, the DB3B includes an integral volume control which is ideal when a lower output is required. The unit is provided with versatile control options allowing compatibility with a wide range of control methods and PLCs. The standard DC unit provides 3 tone stages, each stage has 28 tones available which can be independently selected. The unit can be controlled by reversing the polarity of the power supply (2 stage) or providing a common negative and switching between multiple positive supplies. The DB3B proves its versatility by additionally being able to work with a common positive supply and switching the negatives. The tone stages of the DB3B can also be controlled via voltage free contacts provided by a control panel. The flexibility of the range continues with a wide range of supply voltages. The short flare option is worthy addition to the range offering a high SPL in a compact unit. Zone 1, Zone 2 and non-Ex use. Up to 2 x M20 or 1/2" NPT. Blanking plug available. Ex d / Ex de IIC/IIIC T4/T5/T6. Optional Ex e terminal chamber. Up to 122dB output @ 1m. 3 stage unit remotely switchable. DC supply voltage between 12V and 48V. End of line resistor option. for further details contact MEDC. Ex enclosure - Glass reinforced polyester. Flare - High impact thermoplastic polyester. Stainless Steel mounting bracket and cover screws. Mounting bracket has ratchet facility as standard. Zone 1, 2, 21 & 22 use. Body & lens colour, flash rate, Voltages 12 - 48 d.c. Zone 1, 2, 21 & 22. ATEX Certified, Ex II 2GD. Class I, Div. 2, Groups A*, B*, C & D.
Class II, Div 2 Groups F & G.
Class I, Zone 1, AExd IIB & IIC* T4/T5/T6. – Ordinary locations: Visual-Signal Device. Optional Cast Aluminium or Stainless Steel Wire guard. Up to 3 x M20 or 3 x M25 entries. Remote and local function selection. Body & lens colour, tube energy, relay & telephone initiate, flash rate, voltages 24-48V d.c., 110-254V a.c.
Certified temperature: –55ºC to +70ºC. 5, 10 & 15J versions available. Pipe mount or direct mount enclosure. Four wire and supervisory diode. Optional relay or telephone initiate. Optional cast or wire lens guard. LED version available. (See data sheet for LD15). The PH1 double action pull handle call point has been designed for use in flammable atmospheres and harsh environmental conditions. 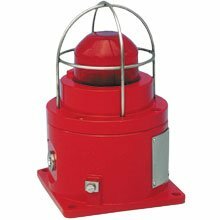 The GRP enclosure is suitable for use offshore or onshore where light weight combined with a high level of corrosion resistance is required. Gross weight 3.2kg (4.4kg Class I, Div 1). Net weight 2.6kg (3.8kg Class I, Div 1). Cover colour, Series & EOL resistors, Diode, Tag label, Duty label. Body colour, LED, series & EOL resistors, diode, earth continuity (Not UL), turn & push, self reset, tag & duty labels. Glass reinforced polyester enclosure – light, strong and not subject to corrosion. 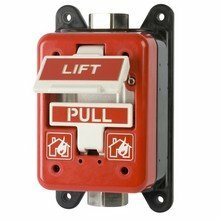 The unit is now supplied with a lift flap that latches firmly in place. (3) Weatherproof & Dust-tight/UL ordinary locations. In line and end of line resistors and/or zener diodes can be fitted. Up to 9 terminals available. 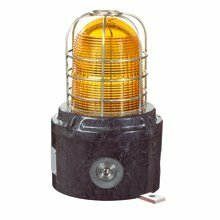 Optional LED – this indicates that the unit has been operated – useful for testing purposes. Earth continuity option for metal glands. 1 or 2 changeover switches. Body colour, LED, lift flap, series & EOL resistors, diodes, earth continuity, terminals, certification, tag & duty labels. 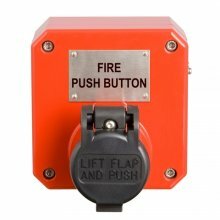 Lift flap available for extra protection against inadvertent operation. Body & lens colour, tel. initiate, earth continuity, flash rate, voltages 24V–48V d.c. 110V–254V a.c. Zone 1, Zone 2 & non-Ex use. ATEX approved, Ex II 2 G.
Certified temperature: –50°C to +70°C*. 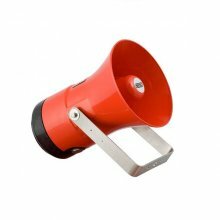 Version with independent beacon/sounder operation now available. 27 Tones, user selectable (dual tone option - d.c. voltage).